Next week Arrow comes back (Jan. 21st at 7/8 pm) with a new episode called ‘My Name Is Emiko Queen’. When Arrow had the mid-season finale, they reviled that the new Green Arrow was a female. 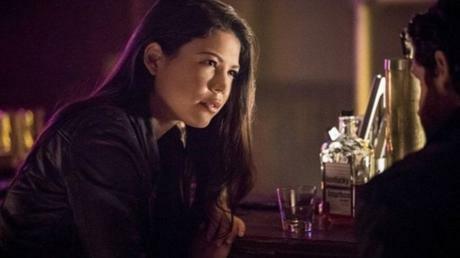 We also found out her name is Emiko Queen (Sea Shimooka) and is Oliver Queen’s (Stephen Amell) half-sister by being Robert Queen’s daughter. When the hit CW show returns, we will find out some questions that have yet to be answered about who this person is but we will also see her point of view. The Showrunner and Executive Producer Beth Schwartz had this to say about the episode. If you are a fan of the Arrow comics during the new 52 era you know that Emiko was just added and her parents are Robert Queen and Shado. The interesting thing about adding this character to the show and having Robert Queen has the father it leaves us wondering who the mother is as they killed Shado (Celina Jade) off and had her have a romantic interest with Oliver Queen. Now that doesn’t mean anything since they had Isabel Rochev (Summer Glau) with both Robert and Oliver. The show is just using this character but putting their own spin on it by aging her up. As we all remember one year ago Thea (Willa Holland) left the show. With having Emiko join the show isn’t to fill that family void that Oliver has but to have the drama that will come with having a step-sister he didn’t know about. Beth had this to say about bringing the new character to the show. Not only will we be learning more about this new character in play but a new Suicide Squad that will include Ricardo Diaz (Kirk Acevedo), China White (Kelly Hu), Slade’s son Kane Wolfman (Liam Hall) and Carrie Cutter (Amy Gumenick). This new Squad will be renamed as the Ghost Initiative. We will find out more about this new squad and the case they are working on in the following episode. Beth also brought to light why we are seeing this group of people again. With all of this new information about what the rest of the season is going to look like what are you all looking forward to seeing? Make sure to tell us in the comments below and tune in on Monday at 8/7p on your local CW Station for the new episode.